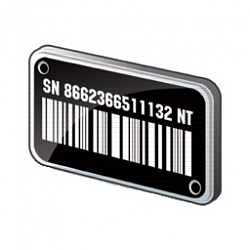 Sometimes abbreviated as Serial No., SN or S/N, a serial number is a unique number assigned to the PC by the OEM (Original Equipment Manufacturer) used for identification and inventory purposes. A serial number allows the manufacturer to identify a product and get additional information about it, for replacement, or as a means of finding compatible parts. This tutorial will show you how to find the serial number of your Windows 7, Windows 8, or Windows 10 PC. 2. Enter the command below into the command prompt, and press Enter. The serial number will only show in the command prompt if the OEM saved it to your PC's BIOS or UEFI firmware. If the OEM didn't, or this is a self built PC, then you may see To be filled by O.E.M in the command prompt instead. 2. Enter the command below into PowerShell, and press Enter. The serial number will only show in PowerShell if the OEM saved it to your PC's BIOS or UEFI firmware. If the OEM didn't, or this is a self built PC, then you may see To be filled by O.E.M in PowerShell instead. 1. Boot to your PC's BIOS or UEFI Firmware settings. The serial number will only show if the OEM saved it to your PC's BIOS or UEFI firmware. If you have a laptop, flip it over to the bottom side. On some laptops, you will see the number on a manufacturer sticker on the bottom of the laptop. On others, you’ll see the number printed directly on the metal or plastic. If your laptop has a removable battery, the serial number is sometimes on a sticker inside the battery compartment, under the battery. If you have a desktop, look at the back, top, side, or inside of the case for a manufacturer sticker. If you can’t find the serial number on the PC itself, look online for instructions specific to your PC's model number. The manufacturer’s website should tell you exactly where to look. If you still have the original product box, the serial number is usually printed on it. Often on the same sticker with the bar code. If you purchased the PC online or in a store, the serial number may be printed on the physical or email receipt. the serial provided is from what ? Good spot. I thought it was my PC. Note: if you have updated your BIOS since buying it, don`t be surprised the the command prompt or PowerShell commands do not work, your BIOS has been overwritten, so only the OOBE motherboard information is there. All my HYRICAN OEM information was zapped away, and replace with MSI's basic info. Just to be clear it is the first powershell command on option 2 that is wrong. Thank you guys. Typo corrected.